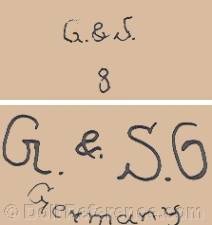 Otto Gans of Waltershausen, Germany made and exported bisque head child dolls and baby dolls, claimed they invented dolls roguish (googly) flirting eyes in 1901 Kämmer & Reinhardt used Gans patented flirting doll eyes, by 1923 Gans registered a patent for walking dolls, some with voices. 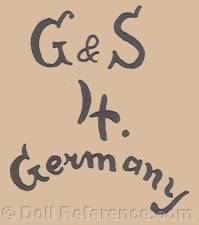 In 1924 Gans registered a trademark of a bird on a shield. Some Otto Gans heads are made by Armand Marseille such as doll mold 975. 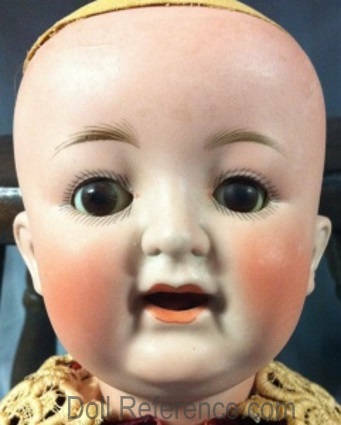 Later dolls are possibly made of celluloid. 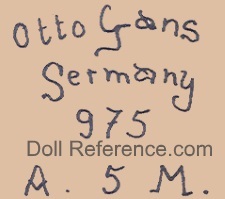 Otto Gans doll mark Germany 975 A. 5. M.
Otto Gans doll marks OG, OGA. 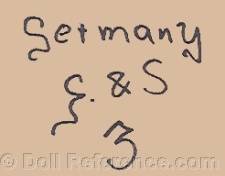 Otto Gans, Hugo Seyfarth and Mr. Heller formed this doll company in 1908. 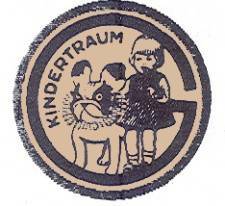 In 1922 the partnership dissolved and Hugo Seyfarth formed a new company with Mr. Reinhardt. made by Ernst Heubach. Seyfarth & Reinhardt dolls were distributed by Louis Wolf & Company. 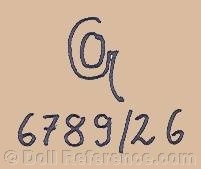 registered doll trade names Elfe doll, My Fairy doll both in 1922.